This homemade crockpot mac and cheese recipe comes together beautifully in your slow cooker. This is no ordinary crock pot mac and cheese recipe because it’s extra creamy and full of flavor thanks to an amazing combo of milk, seasonings, plus cheddar and parmesan cheese. 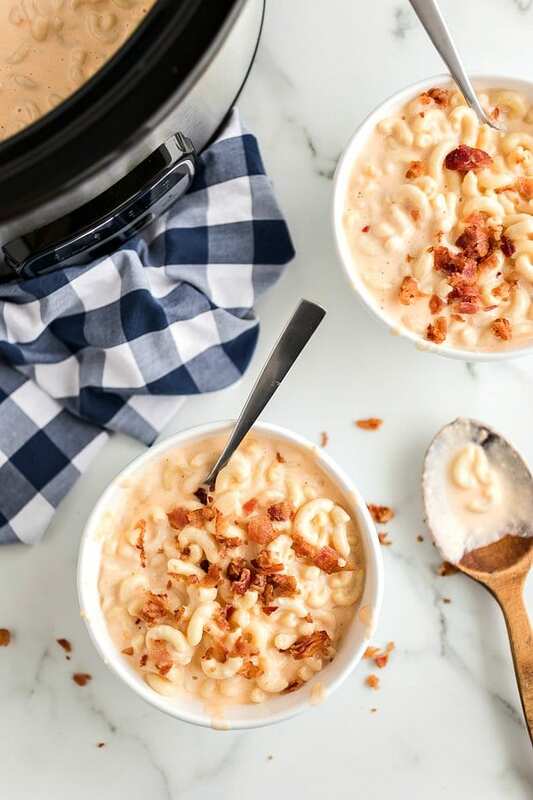 Our super special crock pot mac and cheese recipe wins the hearts (and stomachs) of everyone who tries it – the secret is in the cheese sauce! Yummy alternatives to this recipe are our baked mac and cheese recipe as well as this easy chili mac and cheese. This super fast crock pot mac n cheese is easy to make, and using a slow cooker takes it from bland and boring to extra-creamy and mouthwatering. If you’re looking for a new meal idea in your crockpot, you’ll want to try this for sure. Not only is the flavor of this recipe amazing, it’s so easy to make. 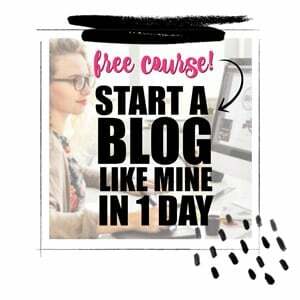 Perfect for busy days! To begin, you’ll fill a large pot half way up with water and bring to a boil. Once the water has started to boil, pour in a little bit of olive oil and the box of macaroni. Cook the macaroni for 2-3 minutes and then drain. Why add olive oil? It helps to keep the pasta from sticking together. It’s such a brilliant cooking hack. You can use it anytime you make pasta. Next up, add the macaroni to a slow cooker. Then add the milk, shredded cheddar cheeses, parmesan, and seasonings. Turn the slow cooker on low and cook for 1 hour, stirring occasionally. Cut the cream cheese into small, one-inch cubes. Stir in the cream cheese and the sour cream until the cream cheese starts to melt.Look at all that ooey gooey, creamy, cheesy yumminess! Cook on low for an additional 20-30 minutes until it’s hot and creamy. Serve it as it comes or with bacon on top. My boys liked adding some extra salt and pepper of course. My oldest also loves parmesan cheese and shakes it liberally over the top of his mac and cheese as well. Crock pot mac and cheese is so versatile. 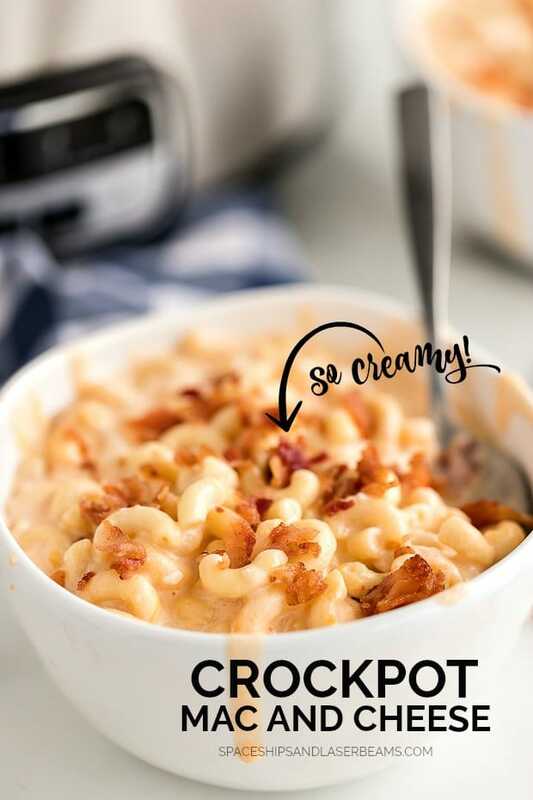 Although we say to serve this recipe with bacon on top, the things you could serve with this delicious crock pot mac and cheese recipe is endless! Plain ol’ macaroni and cheese is very kid friendly, but what else could you pair with this creamy, cheesy bowl of goodness? If you want to sneak in some hidden veggies, broccoli and cauliflower will go pretty much undetected by your children. When they’re smothered in cheese, who can tell the difference? If you can get away with visible veggies, peas, corn and bell peppers add a nice bit of crunch to this soft pasta dish. Serve your quick crock pot mac and cheese with ham, chicken or beef for some protein. If you like something that’s a little bit spicy, buffalo chicken and chili make a great contract to the creamy cheese. My top rated way to dish up mac n cheese has to be what I like to call, “Adult Mac n Cheese”. This is mac n cheese loaded with crab or lobster with extra cheese on top. Talk about simple and tasty homemade meals! 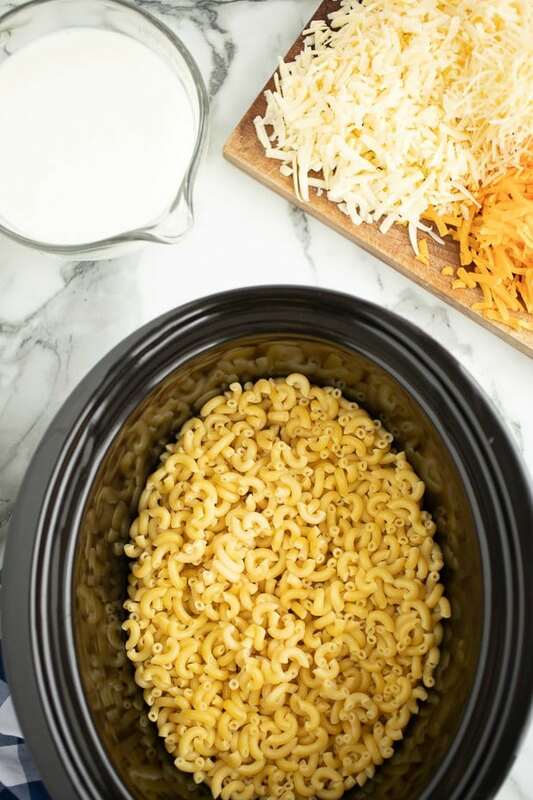 Alternatively, you could make this crock pot mac and cheese recipe with another type of pasta or even noodles for a bit of a twist. And if you don’t have a family of bacon lovers like me, sprinkle the mac and cheese with bread crumbs so you still get a bit of crunch. From start to finish, making your very own crock pot mac and cheese from scratch should take no more than two hours. For the majority of that time, you don’t have to do a thing… Apart from smell the delicious cheesy aroma. Making this no boil crock pot mac and cheese recipe couldn’t be much easier (or quicker!). Simply boil the macaroni in a pan for just a couple of minutes, then drain. Add the macaroni to the slow cooker with milk… Then add seasonings, plus cheddar and parmesan cheese and give it a good stir. Go put your feet up and read a book while you let the crock pot mac and cheese do its thing for about an hour. All you’ll have to do is stir it occasionally. Lasly, add the cream cheese cubes and sour cream and let it cook for another 20-30 minutes. By this point, you’ll hardly be able to wait to taste your homemade crock pot mac n cheese, so dig in. Enjoy the velvety richness. It’s so easy to turn a classic mac and cheese into something that the whole family will want to eat time and time again. This easy, cheesy, creamy family favorite recipe is sure to become a favorite. Fill a large pot half way up with water and bring to a boil. Once the water has started to boil, pour in a little bit of olive oil and the box of macaroni. Cook for 2-3 minutes and then drain. 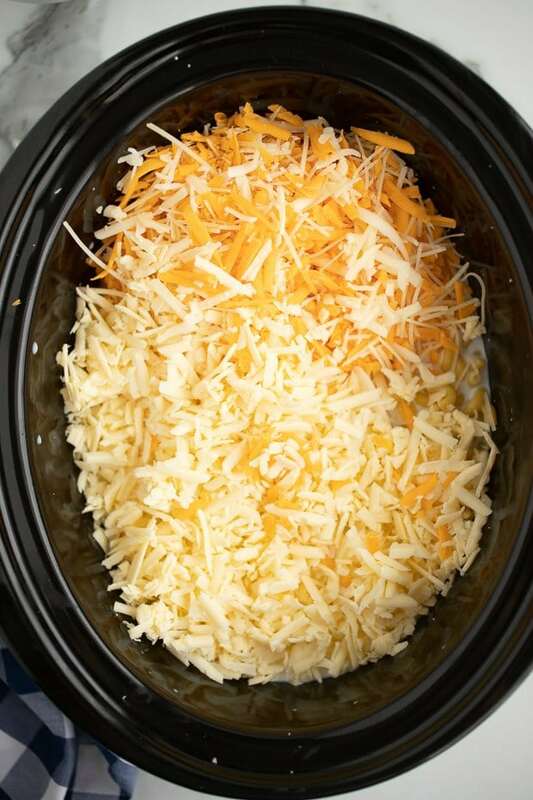 Add the macaroni to a slow cooker and add milk, shredded cheddar cheeses, parmesan, and seasonings. Turn slow cooker on low and cook for 1 hour, stirring occasionally. Stir in the cream cheese and the sour cream until cream cheese starts to melt. Cook on low for an additional 20-30 minutes until hot and creamy. Serve as is or with bacon on top. beautiful place + delicious mac and cheese = perfect! Quite literally JUST made this (as in within the past hour), it’s the best macaroni and cheese I have ever had! My munchkin sat with me in the kitchen while it cooked, and every time we stirred it, we snuck a itty bitty scoop of cheese! M’mm! This looks yummy. I am making it. I’m making this today for a sick neighbor! I’ll think she’ll love it. I’ll let you know! I just made this and all I’m hearing is each of my family members moaning! Thank you for sharing. This is amazing! My boyfriend and I have made this once already. We put smoked sausage in it. It’s literally the best Mac and cheese I’ve ever had. Hi, Ruth – usually it doesn’t last too long at our house 😉 I would say you could leave it on warm for a few hours. Enjoy! Does this reheat well? Like if I made it a day in advance and then served it? Oh HELLO lovely creamy mac and cheese! And that it’s made in the crockpot? That’s just even better. Thanks for making my life easier! I’m always looking for a good mac and cheese and this is a winner! Is the cream cheese really cream cheese like in the video or (like velveeta) in your write up? Thanks! It’s a Velveeta type cheese! Hi! Can you make a double batch of this in the crock pot at once?